Parents everywhere will love how much easier mealtime will become with Tiny Bites™ Food Shears! 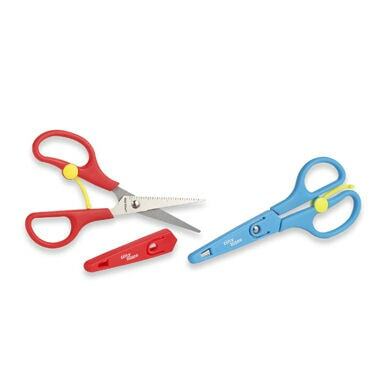 Whether at home or out to eat at a favorite restaurant, Tiny Bites™ Food Shears make it simple to provide young children with bite-sized pieces to ensure that food is safe for consumption. Rather than slicing and cutting away at larger items, such as french toast, pancakes and toast, you can cut right through them with the shears into strips, pieces, and for fun – shapes or letters! Think hearts on Valentine’s Day, stars for your little soccer star – you name it! Tiny Bites™ are super portable, and arrive in a package of two, so you can stash one in your diaper bag or purse, and one in the kitchen drawer. Made of cutlery-grade stainless steel, they are dishwasher-safe, which makes them a breeze to clean, and most importantly, Tiny Bites™ are BPA-free and lead-free. They also come with a child-proof protective blade cover to protect little fingers. Affordably-priced, Tiny Bites™ were created by parents, Ed & Anila Nitekman, who wanted to make mealtimes less stressful for parents everywhere, knowing that common concerns over consumption size for toddlers or how to avoid food battles with picky eaters are typical. You can read more about their story here. *Company provided a sample for this review.